The first waterless wash for matte finishes! Dr. Beasley's Matte Waterless Wash was designed specifically for those with matte finishes AND either a disinclination to using a two-bucket method wash or just no access to that type of water supply. Safely and effectively remove dirt, dust, road grime and other paint contamination from your matte surface with Dr. Beasley's Matte Waterless Wash. Let nothing stand in the way of your perfectly cleaned car! As all professional detailers and detailing enthusiasts know, giving your car a bath with the two-bucket washing method is the safest way to go. You avoid washing-induced swirls and scratches and eliminate the need to correct your paint later. Unfortunately, the two-bucket wash method can be both a time AND water consuming task. 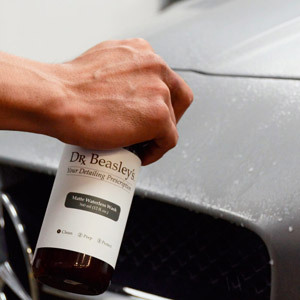 Dr. Beasley's Matte Waterless Wash lets you keep your matte finish clean without the use of gallons of water! If you simply don't have access to gallons of disposable water, or would like to keep a clean finish during the winter months when washing outside isn't practical, then a waterless wash is the way to go! 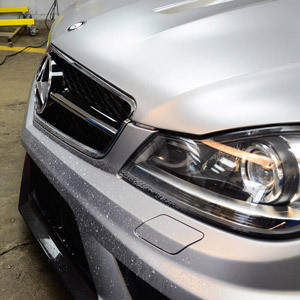 Until now, matte finishes didn't have the luxury of being cleaned with a waterless wash. With such special care requirements needed on a matte surface, traditional waterless washes simply wouldn't work. As they are manufactured with silicone and other glossing agents, streaking, staining, and an uneven blotchy finish would be left on a matte surface. Dr. Beasley's has solved this dilemma with their Matte Waterless Wash! The environmentally safe, high lubricity and wax and silicone free formula safely removes paint contaminants from your matte surface while maintaining the original flat sheen you love. Keeping your matte finish clean doesn't have to be a hassle with Dr. Beasley's Matte Waterless Wash! Spray Dr. Beasley's Matter Waterless Wash directly onto the matte surface being treated. Using a clean and dry microfiber towel, gently wipe the surface of all debris. Go around the vehicle, cleaning one panel at a time until your matte finish is like new again! It's that easy!